Lately I’ve felt like Jimmy Stewart after he figured out he’d been having a Wonderful Life all along. Since 2012, my 80-minute solo show, Whitman Sings has melded all my passions & career strands into one. It began when I tried to wake up high school kids to Whitman’s life-affirming “carols” and “chants” by bringing a boom box to school and rapping “Song of Myself.” Gradually, each poem found its own musical treatment in folk, gospel, and hip-hop frames. Walt began to sound like the spiritual evangelist he actually was … hip, refreshed, and essential again. It’s a brand-new website, simple and streamlined! 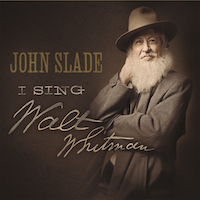 I Sing Walt Whitman (above) is the name of my Whitman album, whereas Whitman Sings is the name of the show. 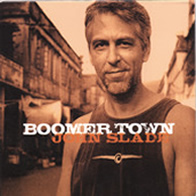 For more of John’s bio, visit the “Stage and Film” page. 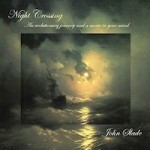 I released another CD, too, called Night Crossing that came out last year; it’s spookier and easier-on-the-ear than my first two rock albums, I Got Plans (2011) and Boomer Town (2006). Thanks for dropping by. Do hang out and visit awhile. Thinking about you all the time. We love and miss you so. I am doing a documentary on Gilda Radner called LOVE Gilda. I am in Detorit now wiht her brother Michael. I found a tape you and your friend from U of M made for Gilda in 1987. I would love ot talk with you. Oh wow! Seeing you at the Marsh here in San Francisco was such a joy. You embody Walt Whitman in so many ways. What an inspiring and beautiful performance. IT is the conventional thing to praise Dante because he of set purpose “used the language of the market-place,” so as to be understood of the common people; but we do not in practice either admire or understand a man who writes in the language of our own market-place. It must be the Florentine market-place of the thirteenth century—not Fulton Market of to-day. What infinite use Dante would have made of the Bowery! Of course, he could have done it only because not merely he himself, the great poet, but his audience also, would have accepted it as natural. The nineteenth century was more apt than the thirteenth to boast of itself as being the greatest of the centuries; but, save as regards purely material objects, ranging from locomotives to bank buildings, it did not wholly believe in its boasting. A nineteenth-century poet, when trying to illustrate some point he was making, obviously felt uncomfortable in mentioning nineteenth-century heroes if he also referred to those of classic times, lest he should be suspected of instituting comparisons between them. A thirteenth-century poet was not in the least troubled by any such misgivings, and quite simply illustrated his point by allusions to any character in history or romance, ancient or contemporary, that happened to occur to him. Of all the poets of the nineteenth century, Walt Whitman was the only one who dared use the Bowery—that is, use anything that was striking and vividly typical of the humanity around him—as Dante used the ordinary humanity of his day; and even Whitman was not quite natural in doing so, for he always felt that he was defying the conventions and prejudices of his neighbors, and his self-consciousness made him a little defiant. Dante was not defiant of conventions: the conventions of his day did not forbid him to use human nature just as he saw it, no less than human nature as he read about it. The Bowery is one of the great highways of humanity, a highway of seething life, of varied interest, of fun, of work, of sordid and terrible tragedy; and it is haunted by demons as evil as any that stalk through the pages of the Inferno. But no man of Dante’s art and with Dante’s soul would write of it nowadays; and he would hardly be understood if he did. Whitman wrote of homely things and every-day men, and of their greatness, but his art was not equal to his power and his purpose; and, even as it was, he, the poet, by set intention, of the democracy, is not known to the people as widely as he should be known; and it is only the few—the men like Edward FitzGerald, John Burroughs, and W. E. Henley—who prize him as he ought to be prized. Also, TR had a framed portrait of Whitman at Sagamore Hill, and also a framed copy of a manuscript document Whitman apparently created while working at the Department of Justice. So, it looks like this all requires a little more research. First, I must complement you on your Walt Whitman performance that I just watched here on your website, as you truly capture his essence. I came across your website in my search for photos of the interior and any other information of the Gristmill Playhouse in Andover, NJ, as I found that you were Artistic Director there. I am the president of the Historical Society of Andover Borough and although we do have some playbills in the Museum, sadly there are no interior photos of when it was the playhouse. Any info or thoughts you may remember would be greatly appreciated, as people, especially the locals, still remember the playhouse as if it only closed yesterday, when it has been closed for over forty years. Thank you in advance. I have wonderful memories of that summer! I was a very young 23 years old and got myself married to lovely Betsy Stoll on our set for “12th Night”. I’ll ask around if any photographs remain. I was the producer of the Gristmill Playhouse and was able to talk John into coming from The University of Michigan to be our artistic director. I have lots of pictures and newspaper articles that I would be glad to send you copies. Ask John for my email. 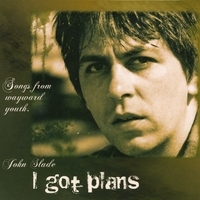 John – I love you! you’ve never given up on your dreams. Am enjoying your new CD very much. More feedback later. Thank you for your letter dated 5th March 2014 and CD. We are currently featuring five tracks (see our home page) and it would be a delight to feature one of your tracks in around one month. If you e mail us the artwork from you CD we can add it to our Facebook page. How did you hear of Sacred Music Radio? Actually, I looked VERY HARD to find a station that fit your description! There just aren’t enough stations who are as inclusive as you are. Thank you, Michael. Thank you so very much for bringing Whitman so powerfully to life in Ojai Monday night. I was stunned–I have never really HEARD Whitman before; I willl forever be reading him, now, with new ears. Your talent is blazing, ferocious. Bless you. 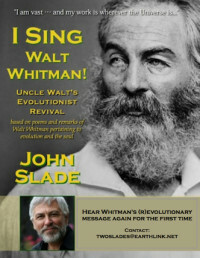 Any interest in bringing your Whitman show to Halifax, Nova Scotia? Would love to organize it! I just watched a video of the I Sing Walt Whitman! excerpt you performed at the What Next conference, which I completely loved. I run a book publishing company (also in Boulder coincidently) called Sentient Publications, and after 12 years of publishing others’ books, decided to co-author my own. It’s called The Tao of Walt Whitman. It offers a few lines of his poetry for each day of the year, organized loosely around Taoist principles. There are also reflections on the poetry and ideas for things to do to express its spirit. I’m just a Whitman fan who wants to turn others on to him. I thought you might be interested in receiving a copy of the book, which I’d be happy to send you in appreciation for your wonderful Whitman celebration, as a kindred spirit, a fellow WW lover. Just send me your address if you’d like me to do that. Connie, I would LOVE a copy of your book. Thank you.